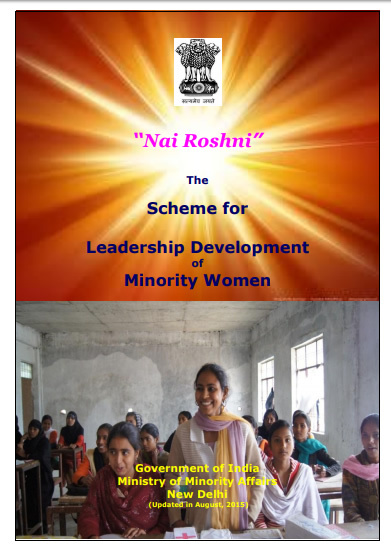 "The Scheme for Leadership Development of Minority Women"
The status of women in the country, particularly those from the disadvantaged sections of the society, is unfavourable. A girl child suffers from discrimination even before birth and also after birth in the allocation of household resources such as food, education, access to health care and at puberty, sometimes coerced into early marriage. Most women in the rural areas suffer from double burden of carrying out less quantifiable work like cooking, fetching water, sending children to school along with agriculture labour, feeding cattle, milking cows etc., while the men folk perform defined activities like selling milk and grains produced by the household. Women in the minority communities fare badly too. They are not just a minority, but the 'marginalized majority' and are sidelined in decision making in the family, and usually cut off from full involvement in the workings of the community and form an equal share in the rewards from social institutions.